Evelyn Colbert, who served in the Bureau of Intelligence and Research [INR] from 1950- 1951, was interviewed in September 2004. Marshall Green served as the Japan Desk Officer at the State Department from 1947-1950 and began his oral history in December 1988. Douglas MacArthur II, nephew of General MacArthur and U.S. Ambassador to Japan from 1957-1961, was interviewed in December 1986. 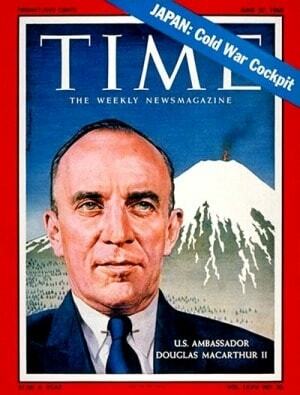 In April 1991, Richard Finn, who served in Tokyo in the Political Advisor’s office from 1947–1950, began his oral history. Charles Stuart Kennedy conducted all of the cited interviews. 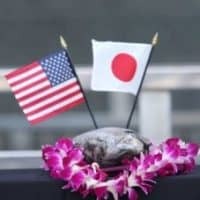 Please click on the links for more information about the U.S. reversion of the Ryukyu Islands, General Douglas MacArthur, the return of Okinawa, or commemorating the 50th anniversary of V-J Day in Japan. COLBERT: Cold War compulsions certainly brought about a change in U.S. policy toward Japan. This was the year of the so-called “changed course” when U.S. emphasis on Japan’s democratization was replaced by emphasis on its economic recovery, hitherto defined as outside American responsibility. Earlier policies, aimed at purging “ultranationalists and militarists” and dissolving the economic monopolies, were softened. The trade union movement, which had become increasingly Communist-influenced, militant, and strike-prone, became the target of laws curbing its activities. New restrictions were imposed on the Communist Party, a major beneficiary of Occupation-endowed political liberties, which had become significantly more radical in the wake of Cominform [Communist Information Bureau, officially known as the Information Bureau of the Communist and Workers’ Parties] criticisms of its earlier “lovable party tactics.” New efforts to conclude a peace treaty were also encouraged by expectations that an independent Japan would become an American ally. GREEN: When the occupation of Japan was undertaken in 1945, it was our expectation that it would only go on for two or three years and then there would be a peace treaty. Meanwhile, to jump ahead a little, John Foster Dulles had been brought aboard in 1950 to try to negotiate the peace treaty with Japan. Until there was a peace treaty, Japan would be under Allied occupation. 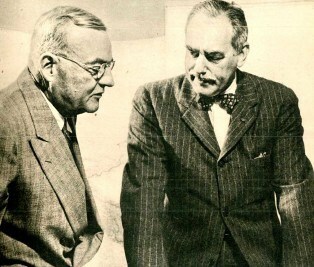 Since it appeared that the occupation period was going to be extended much longer than had earlier been anticipated, it was strongly felt in the Office of Policy Planning in the State Department, especially by George Kennan (seen right) but also by John Davies, Walt Butterworth and Secretary of State George Marshall, that occupations can go sour. It was felt that, in the case of Japan, we had to be very careful. So George Kennan was sent out to Japan in February 1948 by Secretary of State Marshall to discuss with General [Douglas] MacArthur how the emphasis in the occupation of Japan could be shifted from “reform” to “economic recovery.” The idea was to normalize things as far and fast as one could to stave off growing, nationalistic resentment against the occupation. At that time we had various mechanisms for dealing with Japan and with the occupation. 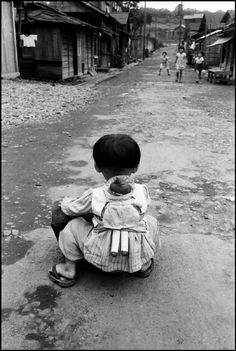 In Washington there was the Far Eastern Commission, on which all of the countries that had been enemies of Japan had their representatives. We met in the old Japanese Embassy here in Washington about once every two or three weeks. I used to go to those meetings. Another international mechanism was the Allied Council in Japan, on which representatives of the Great Powers sat. It met periodically and discussed the broader issues. However, neither of those bodies carried any weight with [Supreme Commander for the Allied Powers General Douglas] MacArthur. MacArthur “ran the show” the way he wanted to, and to heck with all these other people. He had a little bit of the same attitude toward the White House. He felt that Japan was his exclusive domain. 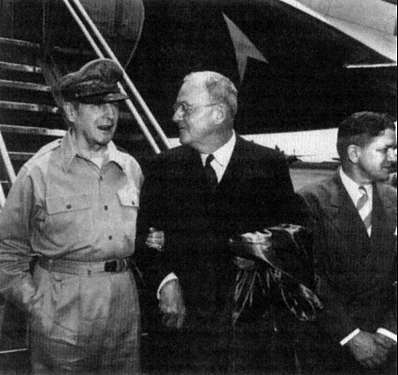 Now, when George Kennan was sent out to Japan to talk to MacArthur (seen with John Foster Dulles at left) about changing the emphasis of the occupation, he was treated, on his arrival in Japan, just as though he was a visitor from a not too friendly power. He was almost seen as a “spy” from the State Department. MacArthur held him at arm’s length. Of course, he couldn’t ignore Kennan. George Kennan had his orders, but MacArthur kept him at arm’s length and wouldn’t meet with him, except socially — for example at a dinner party. It was interesting to see how Kennan operated. Kennan got through to MacArthur in two ways. The State Department already had a representative in Japan in SCAP [Supreme Commander for the Allied Powers] headquarters, William Sebald. Bill Sebald was the head of the Diplomatic Section of SCAP. 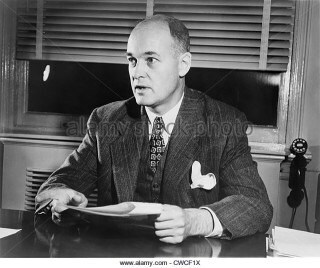 George Kennan eventually got through to MacArthur by casually observing to Major General Willoughby, head of SCAP Intelligence, that MacArthur should not be too concerned about the views of the Far Eastern Commission in Washington, whose work was now largely complete. MacArthur was in the best position to judge what now needed to be done in Japan, and Kennan could be of help to MacArthur in getting MacArthur’s views across in Washington. Through Willoughby and through my intervention with [Colonel C. Stanton] Babcock (an old friend from our service together in the Embassy before the war) it was arranged that Kennan would discuss the origins and current nature of Soviet conduct in the SCAP HQ briefing room where some 100 top brass were present. To return to the fundamentals of what Kennan was saying to MacArthur: he said that we have to move as far and fast as possible toward a more normal type of relationship with Japan and toward putting Japan much more on its feet and taking care of itself. We must be aware that if we move too slowly, nationalism will overtake us, and heaven knows what will happen. This was always presented in terms suggesting that MacArthur knew this better than he did. Kennan never lectured MacArthur. The kinds of things he wanted to end as quickly as possible — and it was carefully targeted — included the reparations and decartelization programs. He called for an end to the “purges” immediately or as soon as possible. He said that the Japanese should have some kind of economic representation abroad. (This last point I was to take on as my own responsibility and work very hard on it.) Improvements should be made in communications channels. Kennan placed the greatest emphasis on setting up better internal security in Japan. He was appalled to see how the Police Force was all divided up. The Japanese had inadequate means to maintain law and order in the country on a national scale. He made some recommendations on how to strengthen a democratic Police Force and establish a Japanese Coast Guard that could protect Japan against smuggling, illegal entries, and things like that. 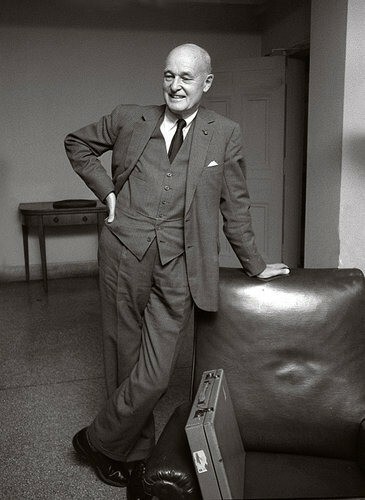 Kennan favored a “neutral” solution for Japan. Of course, General MacArthur did too. You’ll remember that MacArthur talked about Japan being the Switzerland of the Far East. There was a kind of visionary and unreal “latching on” to this idea of neutrality as the solution to Japan’s future, with the United States and other countries serving as guarantors of Japan’s neutrality. It was felt that that was the way we should proceed. Of course, that would have fitted in closely with the mood of Japan at the time. Meanwhile, under its constitution, Japan had been denied having armed forces. That treaty was negotiated in ’50-’51, when Japan was still under occupation. That treaty was the price for the restoration of sovereignty. Until that peace treaty was signed, Japan’s sovereignty could not be restored and the occupation ended. The treaty was, in a sense, one-sided in favor of the United States, because it had to be, for this reason: at the time that treaty was negotiated, Japan did not have one single man under arms, and we took on the heavy obligation of assuring the defense of Japan. When you take on an obligation with a country that doesn’t have a single soldier, sailor, or airman, you’ve got to be able to deploy your troops and forces to meet possible threats if a contingency arises for which the commitment is made. So we were, in a sense, able to do whatever we wanted in terms of moving forces here, there, or anyplace, without consultation. We had a Status-Of-Forces Agreement that enabled us to do whatever we wanted, insofar as they were concerned; the Japanese had no voice in it. Generally speaking, the treaty was not in keeping with our other treaties, because it had been negotiated under entirely different circumstances, our other treaties of alliance. 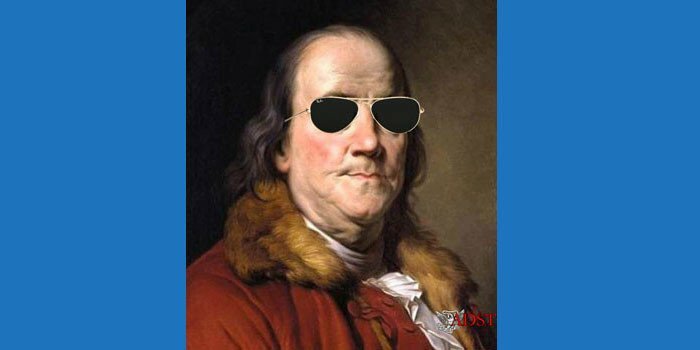 FINN: The peace treaty was an important issue and I was again sort of the bagman for keeping the files and doing the initial drafting on telegrams about the treaty. The treaty didn’t go very far for some time until Mr. Dulles took over in mid-1950. 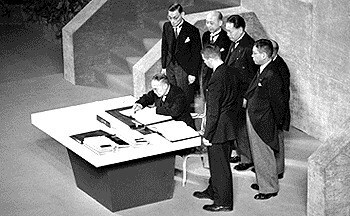 I worked on the peace treaty from about April 1950 until April 1952 when it came into effect and for many months after on problems related to the peace and security treaties. Somebody said that more bipartisanship was needed. So John Sherman Cooper and John Foster Dulles were prevailed upon to take high positions in the State Department. Dulles didn’t have to be prevailed upon really. I don’t think any of us felt that the occupation of Japan would fall apart or fail or would be greatly damaged when MacArthur was ordered out. By that time the peace treaty was moving along. Dulles had gotten a draft by February 1951 that the Japanese had happily accepted. The Allies hadn’t even seen it. This was a very curious way to run the negotiation of a treaty — to get it through your enemy first and then go tell your friends what you have agreed to and please don’t upset the apple cart. Some of them didn’t appreciate that kind of dealing. But it was America’s show, we ran it our way, and they knew we were in charge. I think we were prepared to go and sign a treaty with Japan alone if that should be required. The Allies could have done little to change it, but we never came very near to that.